Oh hello sun, glad you could make it. You've had me worried. 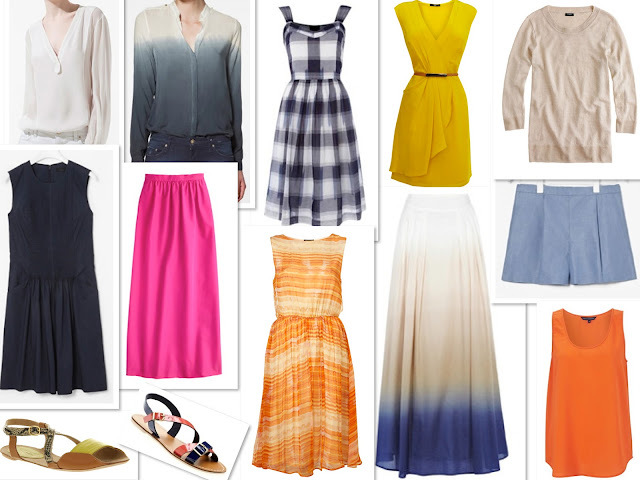 So, finally it's time for a summer clothes blog post. I've always found the most stylish and comfortable hot weather outfit to be a dress with flat, strappy sandals. Pair with a jacket for work, or a light-weight knit for play. For evening, the selection of maxi skirts out there makes your going-out option a no brainer. A long, following maxi skirt with a simple silk vest and flat sandals makes your evening option so simple. Keep prints to a minimum but pile on the jewellery to add interest. If you need a jacket, it's time to dig out your denim jacket from the 1990's which is the ideal partner if you're wearing a bold, solid colour. Another favoured look is a pair of smart, tailored shorts worn with an unstructured shirt. Choose natural fibres (avoiding linen) to keep your look casual, but not crumpled. Add a bold bright nail varnish, and you're ready to go.